All programs closed for 2016/2017. 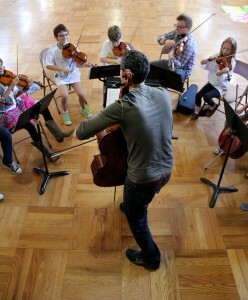 Alternative String Groups (ASGs) : Focuses on what young musicians are listening to right now! What is The Alternative String Group? Our year-round program immerses intermediate violin, viola and cello students with instruction in the art of improvisation ,creative string playing skills + more for ages 10 – 13yrs old. If you’ve been playing your instrument for 2+ yrs practicing classical, fiddling, jazz, or feel like a future rock star String Project LA has the program for you! Our weekly 2 hour classes in the West LA/Santa Monica/Mar Vista area will let the creative energy in your child grow and reach new heights! Young musicians immerse themselves in small ensemble coaching, special clinics, master classes, jams, and concerts spanning world music, jazz, rock, fiddle, and hip-hop styles. Rehearse and perform rock, jazz, fiddle,blues music in small ensembles alongside master artists and creative string playing teachers. 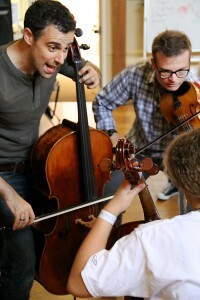 Our Rock Youth Orchestras (RYO) and Alternative String Groups (ASG) began meeting in 2007. Since then, we’ve been having a great time working on every style of music from Freddie Hubbard and U2 to Dr. Dre and Rage Against the Machine. RYO students have enjoyed regular live performances at some of LA’s coolest venues. While we work towards live concerts throughout the year, students can create their own small groups at any time to fit their age, interests, and experience level. (No experience playing in alternative styles or improvising is required.) The class of violin, viola and cello students focuses not just on playing reading notes but understanding rhythm , many different styles of music, singer-songwriter style, improvisation, rock, jazz, blues and many extended techniques.